Well the election results were covered in the previous posts and let us not forget that this is just the beginning for the new government. The real challenges start now and as usual, markets discounted a lot of good things already and profit-booking has commenced. I keep reiterating that 7200-7500 levels were the logical targets for Nifty and they were achieved much earlier than anticipated. 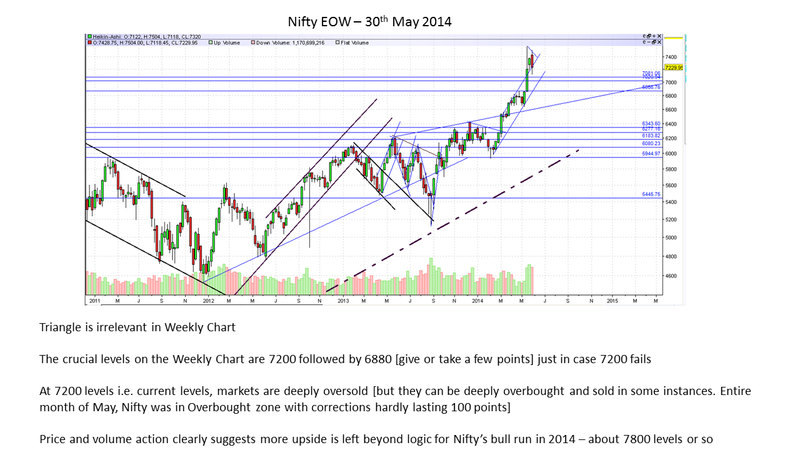 The key levels on daily/weekly/monthly basis are 7200/6900/6600 respectively IMHO. 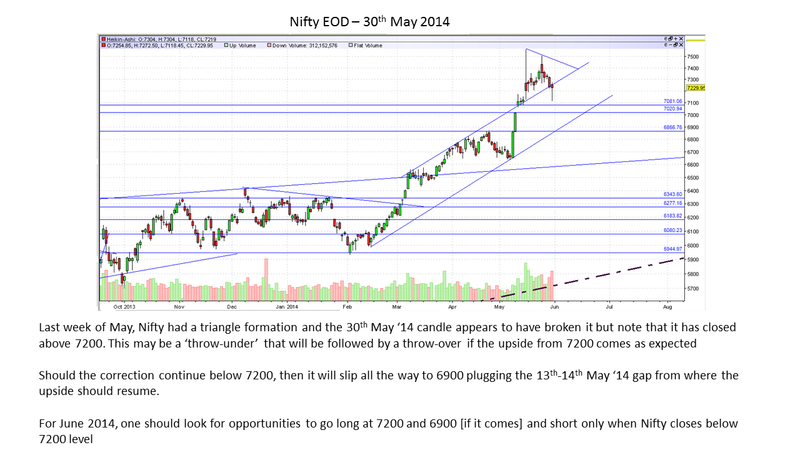 7200 should ideally act as a good interim support for minimum upside of 7350-7400 levels in the next 4 weeks. If Nifty closes 2 consecutive instances below 7200, the next logical halt will be 6900, at which point all gaps created in May '14 will be filled [there is 1 gap pending to be filled]. Corrections are healthy and good for the market and gives opportunities to re-enter the market. Although the logical target has been achieved, technicals and euphoric sentiments suggest that Nifty may take a shy at 7800-7900 levels once more in 2014 [either around 21st June '14 or towards Diwali '14] provided no other Black Swan events come through. This is still not the time to short the market whilst equity portfolio gains can slowly be banked. 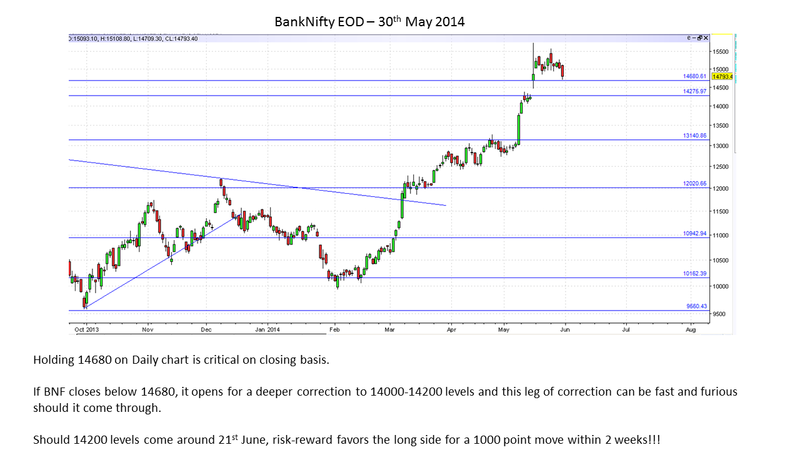 From a trading perspective, in the beginning of June, a swing trade for shorts can be initiated with breach of 7200 levels for a target of around 6900 [+/- 50 points]. As it happens in most instances of 21st June, Summer Solstice, markets tend to bounce back very sharply. As I keep mentioning from time to time, 21st March onwards, 21st June onwards, 22nd September onwards and 21st December onwards, the markets tend to move dramatically in either direction and with a good swing [albeit, in some instances a bit delayed] and during such instances options are a good bet. Always beware of the India VIX levels and Implied Volatility levels as the IV can significantly impact option pricing. For Longs, one always has the option to buy equity. 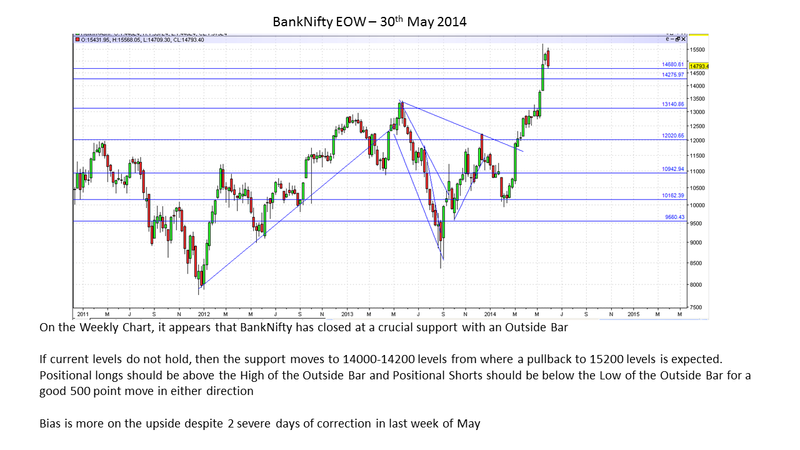 For shorts, one needs to have a technical confirmation before buying Puts or shorting futures. From an investment perspective, the A-group counters were already identified from August '13 onwards with levels and most of the counters achieved their targets as well. Now it is just a matter of trailing positions and cutting long exposure to equities in A-group shares. Even in the mid-cap space, ETFs like JuniorBees, InfraBees have played out their stories for now. Accumulation in these counters should now be only after a 15%-20% or more correction and that will be updated as and when such opportunities come through. Opportunities for quick long/shorts will be updated regularly via Twitter on the top left hand side of the blog. Gold is coming to a good buying point again. It may retest the lows of last year once around 24k-25k levels where it should consolidate for sometime and then slowly start moving upwards again. QGOLDHALF and GoldBees remain preferred instruments to buy the same. Silver should find a bottom around the 35k per kilo mark and buying physical units makes more sense. Enjoy the bull run till it lasts and for now ignore calls for 9k, 10k etc on Nifty. There is only so much that an index can rise in a particular year and markets discount a lot of news in advance. Keep cashing out from time to time so that it can be redeployed when needed.